I needed some temporary data storage for a few days for a migration project, so I wanted to know which filesystem to use, that would give me the most available space. 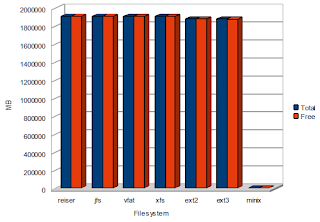 I expected FAT to be among the top ones, as it's not a very sophisticated fs, and didn't expect much from ext2/3. I'm also a bit biased towards XFS, so I kind of expected better results. Tests were done with default mkfs. * settings, only exception is root reserved blocks on ext2/3, which were set to 0. The above output is from df -m. I didn't always pay attention in Operating systems class, so the results of minix surprised me a bit. I have a sort of love-hate relationship with reiserfs, but for today, it earned itself a job.